How do you go about getting a company product--and company--funded through crowdsourcing? Is it even possible, and what are the pitfalls involved? To learn a bit more, we sat down with Patrick O'Neill, the founder of olloclip (www.olloclip.com), the developer of a popular iPhone accessory, a lens which fits directly on your iPhone. Olloclip managed to fund and start the company based on crowdfunding, and is one of the most popular projects that has been funded through Kickstarter. First of all, tell us about what olloclip's products are? 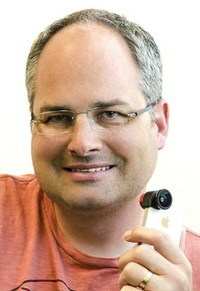 Patrick O'Neill: Olloclip is a three-in-one lens for the iPhone 4 and 4S. It provides a fisheye, wide angle, and macro lens which fits into your pocket. You can slide it onto the corner of your iPhone, or you can flip it over, and it you get a wide angle lens. Unscrew that, and you get a macro lens. It's pretty easy to use, and people are taking amazing pictures and putting them on Instagram, Flickr, and all over the place. It's incredible to see. Patrick O'Neill: I've been into photography for my whole life, and my interest has always been in technology. For my whole career, I've been in the technology business, working for IBM clone companies, storage companies, and then add on products for PDAs, and then working on early smartphones. I've been focused only on mobile for the last twelve years. This is something I've always wanted to do with smartphones. I thought it would be wonderful to have a creative option with a smart phone, and allow you to switch lenses on a smart phone. In the early days, the cameras on the smartphones were not very good. However, when the iPhone 4 came out, the camera was good enough, and I had an epiphany on how to elegantly mount the lenses. With that, olloclip was born. I had just heard about Kickstarter, and I thought that would be a brilliant place to launch the idea. We hear you had great success crowdfunding the effort, what's the story there? Patrick O'Neill. I had probably spent eight months perfecting the product, and getting the design where it needed to be, and all patents filed. I'd already done hundreds of iterations of the design before we ever launched on Kickstarter, and I invested a lot of money in getting it ready for the Kickstarter phase. I was all-in, and even if Kickstarter didn't meet my funding goal, I was confident I was going to be able to get it to market, although it would be much harder to go that way. Kickstarter gave us 1500 backers from over 50 countries around the world, and they were very enthusiastic early adopters--otherwise, they wouldn't be backing things on Kickstarter. They also went out, and spread the word, and helped us take this to the masses and give us recognition. Had you thought about more traditional ways of raising funding for this, such as banks, angels, or venture investors? Patrick O'Neill: Not really. I was the angel investor, really. I really wanted to try to do this with Kickstarter, and the whole idea was going that route. I never had any experience with venture capital and all of that, and never would have known what to do. Kickstarter just seemed like a beautiful way to do this, and it was an amazing experience. What was it about your project that drew interest of people? Patrick O'Neill: I think we inspired people. When people see the product, and when people are walking around with olloclip on their iPhone, strangers always ask them: what is that? That's because it's just such an incredible thing to see a lens on an iPhone. We always knew this would happen, so that even today, when we ship, all of the product goes out with two little cards, which we tell users to bring with them when you are out, so that when people ask, you can hand the a card to let them know what it is and where to get more information. Because the product is a social product, and taking pictures is a social thing, I think that made it easier for this project to get more traction and to spread more virally. It's a very innovative product, and the way we've accomplished mounting it on the phone is something no one else has ever done. Was there any downside to crowdfunding? Patrick O'Neill: It was absolutely all upside. We didn't have to get outside investment, and didn't have to have people looking over my shoulder and second guessing our decisions, or telling us the correct way to go about running the business. What advice would you give to anyone trying to raise money for something on Kickstarter? Patrick O'Neill: I have had lots of people email me to tell me they'd seen olloclip, and were interested in doing their own project on Kickstarter. Sometimes they said they had an idea, and wanted to get a patent on it, and wanted to launch on Kickstarter next week. But, they don't have a prototype, don't know how much it will cost, and still want to launch next week. I them them, straight up, that they have to do the hard work, do the development phase, figure out the costs, and if you want to get a patent, you have to file that provisionally at least before you publicly disclose it. You need to get all of that done. I'm a big fan of Steve Jobs, and followed him my whole life, from the Apple II Plus in 1982 I got from my grandmother, which was my first computer. His attention to perfection inspired me. I asked, as we were going through development, what would Steve say? Is it ready? An inevitably, it was not ready. So, we kept iterating and we're happy we did that. How much did you raise on Kickstarter? Patrick O'Neill: We asked for $15,000, and ended up raising over $70,000 in 30 days. One last thing with Kickstarter, is the group of people I brought in to help me. I spent twenty years in the technology business, and the person running sales also has twenty years plus in the business. We already planned to turn this into a business, and had planned to use Kickstarter to help us achieve that. There are lots of people who are not thinking that, but instead are thinking they'll just make something cool or develop something. That's now how we used Kickstarter. We used it to literally kickstart our business, and it's fantastic for that. One other thing, is we would have hired a PR agency before we started Kickstarter, there are lots of newer projects putting that effort in from the beginning, and they're getting lots of benefit. We're very happy with what we achieved, and where we are now, and it blows us all away on how far we've come. We're amazed and thankful. Patrick O'Neill: We have a lot of cool products in the world. We've invested in a 3D, rapid prototype printer, which we have going 24 hours a day iterating our designs more quickly, and that keeps the ideas flowing. We've also moved three times since our Kickstarter days, and moved into a big new locatoin in Huntington Beach, with a bunch of designers and engineers working with us. We've got lots of cool things in the pipeline.